Napoleon achieved great things on the battlefield, and is sometimes hailed as one of the greatest military geniuses of all time. Today, with all the latest communication equipment, no one would suggest that one man could control a whole battlefield, and two hundred years ago that was just as true. In fact Napoleon could call upon a large array of individuals - marshals, secretaries, ADCs and so on - who formed a very efficient staff operation, allowing him to concentrate on strategy knowing it would usually be well implemented. 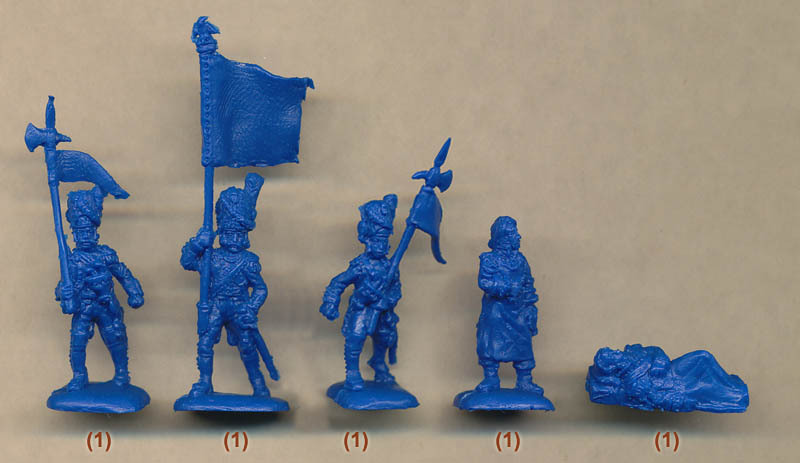 Some time ago Italeri produced a set of French Imperial General Staff, and this set from Strelets covers much the same ground, but with so many more figures and poses it does so in much greater depth. Perhaps because of their fairly poor record with multi-part figures, Strelets have wisely chosen to mould everything, man and instrument, as one. Generally this works. However the 'Jingling Johnny' has a very short staff (for no apparent reason), and we find it highly unlikely that the cymbals would have been held out to the side in the manner shown here, although we understand the reasons why it was done this way. The drum is an odd affair. Basically it is the size of a side drum but worn on the chest as if it were much larger. In addition, the drummer has only one stick, and is holding the skin of the drum with the other hand, which would not improve the sound made. The exact makeup of a band was not laid down, and varied depending on many factors, not least the whim of the colonel of the regiment, but we would have expected to have seen proper side drummers and trumpeters, clarinets and trombones. Also of course the numbers of each instrument varied according to musical necessity - there would not have been an equal number of each in any band. Finally, the absence of a drum major or band master is a serious omission. The figures that are included wear a generic and satisfactory uniform, but there are just far too few of them. Moving further down still, the next row shows us the Emperor's servants hard at work. The first two men are footmen or valets, busy serving drinks and arranging a chest (which were known as 'necessaires') which seems to be packed with a dining service. Beside them is a Mameluke, resplendent in his exotic oriental costume. Napoleon had two such servants - Roustam, who served him from the Egyptian campaign until 1814, and 'Ali', who served him from 1811 until his death 10 years later. This figure could easily be either, and has been correctly costumed. Finally this row has a man out of uniform and wearing a bonnet de police. He carries a bowl and a towel and is described as a hospital orderly, but could be used for many different scenarios. The last full row contains an infantry colour party and a medical vignette. The colour party consists of a standard bearer, called a porte-aigle, carrying a slightly non-rectangular and small flag on its eagle staff, flanked by the second and third porte-aigle, veteran soldiers who guarded the flag with their spontoons and who each carried a brace of pistols in a breast holster. 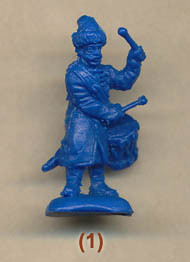 All the details of this little group are correctly sculpted here, and are a useful addition to sets of infantry, which never include a full colour party. Beside the party there stands a surgeon, wearing his apron and holding some instrument, and to his left is his patient, apparently resting on either a bed or a pile of packs. He has a bandage around his head - the classic mark of a wounded man in this hobby - but too little of his uniform is visible to identify an arm of service, which makes him a more useful figure. Nevertheless given the title of this set we would venture that this could be used as Marshal Lannes when he was mortally wounded at Aspern-Essling, and the surgeon is none other than Larrey, the surgeon in chief, who attended him that day. The figures are all accurately sculpted, and show fair levels of detail. Aside from our earlier remarks about the instruments, we thought some of the articles they are carrying were somewhat too fat (for example batons and telescopes), and the eagle on the end of the batons is wrong and should be removed. However there is no flash, and in general we liked the choice of poses, with a particularly attractive mix of marshals - some very excited and others very sober! We have two main gripes. One is that everyone is on foot. At the time gentlemen would never be on foot during a battle, and most marshals would stay in the saddle throughout an engagement. However Strelets later made a companion set with mounted marshals, so together they cover any eventuality! Our other problem is with the band. It's a nice idea, but why only make seven figures? Not enough to compose a realistic band, regardless of how many sets are purchased, and yet enough to seem to waste several spaces for figures that could have included items more directly related to the title of the set. Perhaps some future set might complete the line-up, but as it stands these are of limited use.